Many anglers prefer the method of throwing streamers for trout fishing. It’s the best way to get that big tug while fishing larger baitfish and leech for trout, whether from a boat or on the bank. And even though you are not landing fish, with those swipes and long follows, it is certainly the best bet for some action at the start of the spring. During this period, the water is typically higher and colder, and fewer insects are hatching, thus making a streamer pattern an easy option due to its simplicity. But don’t fish it like you do in the mid-summer or early fall. Here are some tactics to improve your fishing this spring. When the temperature of water is quite cold due to snowmelt, early season rain fish are less forceful and wouldn’t move almost as far to eat. At such times, change your retrieve speed and go very slow than you would later during the season. Go at least deeper than normally you would fish a streamer. Use a very heavy bug or a sinking-tip kind line. This makes casting a little difficult, but will be worth in terms of getting your fly before more fish that are ready to have a look. During the spring, you need to have your bugs down and a great way to do this is fishing upstream. Throw upstream a quartering cast, and right when your fly hits the water, give it a big mend, which will make your bug get down where the fish are. This will work with a floating or a sinking line. Dead drifting your bugs is an excellent way in spring when fish are less active in chasing down a baitfish. Try it with a natural material leech pattern and a sinking line. 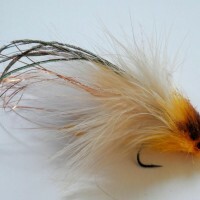 Use streamers that have a lot of natural material like marabou, peacock or rabbit. Characteristically while fishing these flies slower, this sort of material offers a realistic action and only moves at slower speed. Prefer streamers having heavy weight such as tungsten bodies or heads. You might think it hopeless, but it’s really effective. Fishing two streamers in line, that too one dark and one light is tremendously advantageous. Firstly the lighter color gives you the right location of your streamer and also attracts fish. Secondly, it gives fish the option – if it doesn’t like darker color, it can chase the lighter one, or vice versa. Some anglers are of opinion that you should tie a smaller pattern followed by a larger one, creating a scene of a big fish chasing a smaller one. If that works for you, try it. Using fluorocarbon while throwing streamers works very well. It is more abrasion-proof and sinks better while throwing these kinds of flies. In spring, when water is dirty, sizing up is a nice option because you lose less fish and fewer costly flies like streamers as underwater hitches are harder to see. It is agreed that you might miss a few fish due to the larger tippet, but if a fish is steadfast for a streamer, it’s possibly going to eat it even though your tippet is a little larger than usual.